Deal Book. Saputo Incorporated has announced a deal to acquire Morningstar Foods LLC from the Dean Foods Company for a cash payment of US$1.45 billion which will be financed on a debt-free basis with a new bank loan for that purpose (Reuters, December 3, 2012, Saputo to buy Dean Foods Morningstar unit for $1.45 billion). 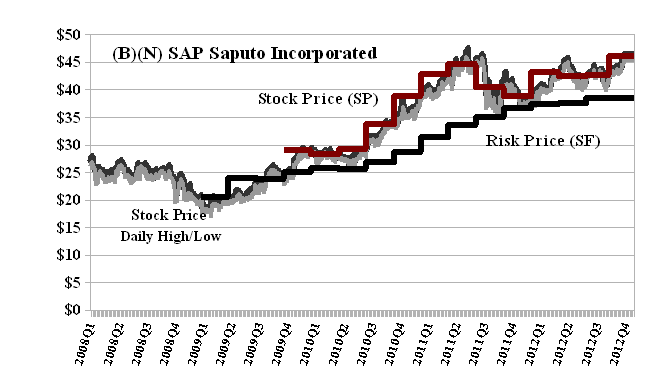 Saputo currently has total assets of $3.5 billion and net worth or shareholders equity of $2.1 billion and a total debt of $1.4 billion that is about to be doubled. The combined businesses will have approximately 12,000 employees including 2,000 employees from Morningstar and 57 manufacturing facilities in five countries and it is anticipated that the Morningstar operations will add positively to operational earnings (before interest payments and taxes) immediately. The stock price also responded positively and is up 3% for the day as is the stock price for Dean Foods although (from a company statement) the proceeds from the sale of Morningstar (which they have owned for more than fifteen years) will be used more prosaically to pay down debt. “Stock prices”, of course, don’t have much to do with business decisions (absent a fraud or felony) and nothing much to contribute to business success (please see, for example, our recent Post on Initial Purchase Offers (IPOs), November 2012). It’s also surprising to many investors and most analysts that neither “fundamental analysis” nor broad brush indicators such as the Price to Earnings Ratio (P/E multiple) for the company or in comparison to its industry, have much to do with stock prices in a reliable way (please see our Post, The Active Investor (DOA), November 2012). To put it another way, “buy low and sell high” as a portfolio strategy doesn’t work however counter-intuitive that might sound. However, on the plus side, we don’t know of any investors who “invest” in the stock market in order to have a better chance of losing their money (sic) and we can take that as a given (please see our Post, The Price of Risk, August 2012) despite the many odd things that investors seem to do, possibly due to anxiety or “concerns” in the absence of insight. In our view, investors invest in the stock market in order to keep their money and have some chance of obtaining a positive return that exceeds the rate of inflation, something which their cash alone can’t do (absent a deflationary economy) and which might only be obtained with some greater reliability with “fixed income” investments in government and corporate bonds but which also, generally, absent an “inflation or economic surprise”, should not be expected to return much more than inflation. Moreover, finding good things to invest in that are outside of our own efforts is fiercely competitive (please see our Post, Numbers 20:12, August 2012). There is, in fact, a lot of money in cash and bonds chasing too few investments that are likely to provide a positive return above the rate of inflation. The “price of risk” or Risk Price (SF) (please see Exhibit 1 and 2 below) demonstrates such “likeability” – we invest in order to keep our money and obtain a hopeful return above the rate of inflation – and stock prices that tend to be above the “price of risk” or Risk Price (SF) and for which the Risk Price (SF) is rising demonstrate that investors “like” the company and will continue to remain committed to it and are, therefore, in a good position to demand and wait for higher prices. Which they do. Please see any of our Posts on The Perpetual Bond™ which invests only in such companies and demonstrates that “buy high and sell higher” is a meaningful and actionable portfolio strategy for risk averse investors. Which is all of us absent the gamblers whom we have already mentioned. Saputo Incorporated is engaged in the production, sale, and distribution of dairy and grocery products. It offers mozzarella, ricotta, mascarpone, provolone, and cheddar, as well as other specialty and fine cheeses, fluid milk, and a range of dairy products. 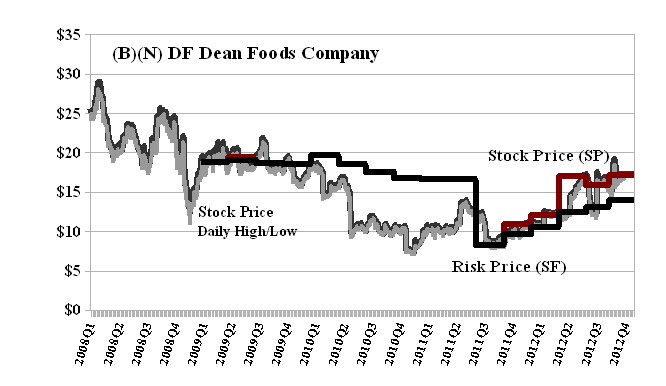 In contrast (please see Exhibit 2 below), both the stock price (apart from volatility and faint hopes) and the Risk Price (SF) of Dean Foods have been declining since 2009 until there was the beginning of a recovery (and reversal of fortune) in mid-year 2011 (less than a year ago). Nevertheless, Dean Foods currently has a market value of about $3 billion (about 1/3 of the market value of Saputo but up significantly from last year) and total assets of $5.6 billion and total liabilities of a similar amount, $5.6 billion, leaving a net worth or shareholders equity of $51 million which is up from negative (-$100 million) at the end of last year and might explain why Dean Foods must now sell Morningstar, the “cream in our coffee”, so to speak. Dean Foods Company is a food and beverage company in the United States which conducts its business through three business segments: Fresh Dairy Direct, WhiteWave-Alpro and Morningstar.